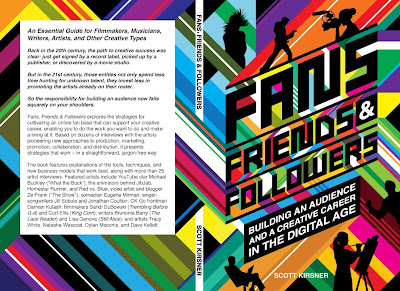 Fans, Friends & Followers – “Building An Audience And A Creative Career In The Digital Age” (Scott Kirsner 2009). A few months back I collaborated with Scott on the Cover Wrap for his new “Must Read” book for anybody trying to make it happen in 2009+. Scott also interviewed me about my history and strategy with my endeavors. Keywords: Side-Hustle, Moonlighting, Promos, Blog, Cross Pollinating, Momentum, Alliances, Collaborations, Networking, Pitching, Dedication, Minding Your Books, Etc. *Interviews with 25+ “Creatives” in Film, Music, Art. Grab a copy. Click-Zoom.